Over the last several decades, different methods have been developed with the purpose of promoting the regeneration of soft and hard tissue in the dental clinic, including the use of biomaterials. In this context, blood concentrates are promising clinically relevant products by offering an alternative source of minimally invasive autologous regeneration. Platelet aggregates can be generated from the patients' own peripheral blood and concentrated by centrifugation, thus being able to release different growth factors (GFs) with well-documented desirable effects in tissue regeneration. In almost 20 years since its proposal, different protocols to produce PRF have been presented in the scientific literature aiming to improve the biological properties of these autologous biomaterials. Most protocols seek to increase cellularity within the fibrin mesh, trying to improve the distribution and production of cytokines, mainly GFs, in the receptor site. However, while different protocols for autologous platelet concentrates are often suitable for specific clinical applications, limitations in the stability of the fibrin mesh may compromise their applicability to surgical procedures that demand improved stability. In cases where there is an attempt to use the biologically derived membrane as a protective barrier to prevent the advancement of soft tissue in the bone graft, the efficiency of the fibrin mesh for guided bone regeneration procedures is not well defined. A recent study demonstrated its stability and the ability to release cytokines for up to 28 days after production when in a biological environment. However, there are precise estimates neither of the actual residence time of this membrane under the bone graft after the operative procedure nor of the effect of enzymes such as metalloproteinases in their degradation, which could impact its efficacy as an autologous barrier. This desired clinical application indicates the need for further development of protocols aiming to further modulate this stability without losing the controlled release of cytokines from the blood at the site of surgery. The use of serum albumin in the field of tissue engineering is widely reported, which is a protein abundant in the human body and easy to isolate, from blood plasma precipitation with high purity and homogeneity. In addition to providing a compatible structure for cell proliferation, biomaterials enriched with albumin showed little reduction of their dimensions over time (dimensional stability) suggesting less degradation in vitro. Furthermore, one study has demonstrated that the association with albumin can modulate the fibrin network ultrastructure and permeability, inducing fibers with increased thickness and a coarse nodular appearance. In view of these data, the association with denatured serum albumin could represent a possible improvement in the PRF-based framework, which is a totally autologous, biocompatible and possibly more durable material with a longer duration of action. In this context, the present work proposes a protocol for the production of an autologous biomaterial for the treatment of osseous defects, presenting extension and high stability related to association of a dense fibrin matrix of concentrated growth factors (CGFs) with denaturized serum albumin. This preliminary study additionally presents an assessment of the initial controlled release of GFs. The cellularity of such membranes offers the basis for further research on the effectiveness of said material for guided tissue regeneration. The procedures were developed according to the principles recommended for experimentation with humans determined in the Declaration of Helsinki, revised in 2000. The procedures of this study are part of the project approved by the Research Ethics Committee HUAP-UFF (CAAE 57080116.0.0000.5243). Peripheral blood was collected from four healthy donors, with no history of anticoagulant medication use, using 9 ml tubes, without adding any additives (Vacutube, Biocon ®, Brazil). For the production of each membrane, two tubes were positioned in the vertical rotor and fixed angle centrifuge (Medifuge ®, Silfradent, Italy), and the protocol was applied to obtain the CGF in the liquid phase (LPCGF), as described by the manufacturer. After processing, it was possible to observe plasma and the remaining decanted blood material containing red cells. Two milliliters of the initial portion of plasma (platelet-poor plasma [PPP]) was collected with a syringe (Injex ®, Brazil), while the other blood portions (buffy coat, LPCGF, and red blood cells) were reserved at room temperature (20°C). The syringes containing PPP were inserted into a device for human serum albumin denaturation activated plasma albumin gel (APAG ®, Silfradent, Italy). After 10 min in an operating temperature of 75°C, the syringes were stored at room temperature for another 10 min and protected from ambient light (as recommended by the manufacturer). The denaturized albumin was deposited into a glass container, to obtain the desired shape. Subsequently, using a 10 ml syringe (Injex ®, Brazil) and an 18G hypodermic needle (Injex ®, Brazil), the LPCGF and buffy coat portions were collected in an approximate volume of 4 ml, added to the denaturized albumin on the glass container, and then gently mixed with tweezers. After waiting for the fibrin polymerization process (approximately 5 min), the membrane was formed with the previously established format. [Figure 1] demonstrates a scheme of the production of the Alb-CGF membranes. Immediately after production, the membrane was fixed with Karnovsky's solution and postfixed with 0.2 M sodium cacodylate solution and 1% osmium tetroxide solution, finally being dehydrated in alcohol solutions (ranging from 15% to 100%) and hexamethyl disilazine. The Alb-CGF membrane had its structure analyzed through scanning electron microscopy (SEM). The material was metalized with gold and observed at 15 kV with a scanning electron microscope (JEOL JSM-6490 LV, JEOL, Japan). 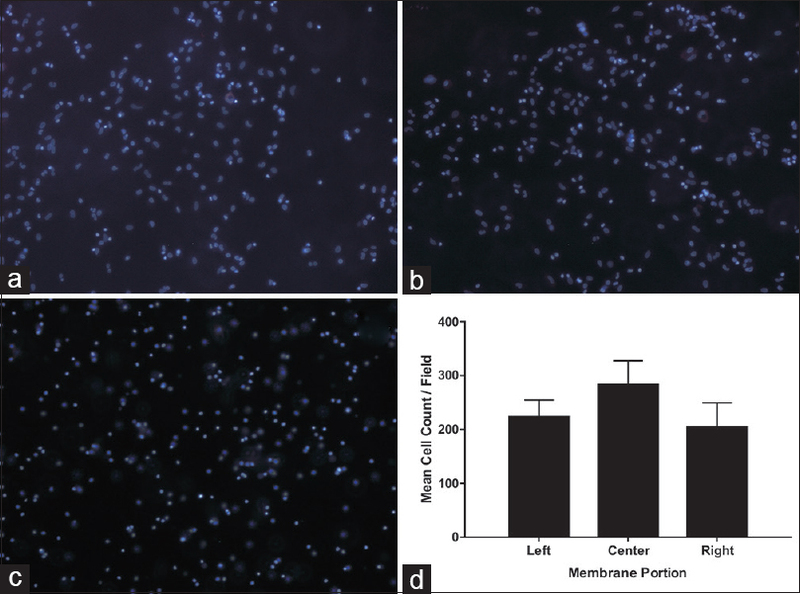 Fluorescence microscopy was utilized as a tool to evaluate the presence of nucleated cells within the Alb-CGF membranes. Seven days after production, three membranes were fixed in 4% paraformaldehyde for 25 min and stained with 1:5000 4′,6-diamidino-2-phenylindole and then diluted in saline. Samples were observed in an inverted fluorescence microscope (Axio A1, Zeiss ®), and three adjacent and nonoverlapping fields were photographed for three different areas of the membrane: center, left, and right borders. The cell density in each field was calculated with the help of Image-Pro Plus 6 (Media Cybernetics, Maryland, USA) software. To analyze the dynamics of the release of GFs over time, PRF membranes were cultured for 7 days after their preparation. Membranes were incubated in triplicate in 6-well culture plates (TPP, USA) in the presence of 4 ml of Dulbecco's modified Eagle's medium (GIBCO, USA) without antibiotics, in a humidified atmosphere at 37°C/5% CO2. Aliquots of the extracts were collected at 1 h and 7 days of culture and stored in an ultra-freezer at −80°C. The eluates were used for the determination of GFs. For the detection of biomolecules, conventional enzyme-linked immunosorbent assay (ELISA) assays were used. Aliquots of 1 h and 7 days were analyzed for the presence of fibroblast growth factor (FGF)-b, vascular endothelial growth factor (VEGF), and platelet-derived growth factor (PDGF)-bb by ELISA using commercial kits (PeproTech ®, Rocky Hills, NJ, USA). The comparison of the cellularity in the three portions of the membrane, as well as the GF release between the two different experimental times was performed by one-way ANOVA with posttest of Bonferroni, considering an alpha error of 5%. Statistical analysis was performed using GraphPad Prism 6 software (GraphPad Inc., California, USA). The proposed association of LPCGF and denaturized albumin by mixing on a glass vessel [Figure 1] resulted in a solid, opaque moldable membrane [Figure 2]. Ultrastructural evaluation of the Alb-CGF membrane was performed through SEM as shown in [Figure 3]. It is possible to observe a very dense surface [Figure 3]a and [Figure 3]b, with very evident deposition of a layer of denaturized protein [Figure 3]c and [Figure 3]d, which is clearly coating the fibrin fibers [Figure 3]c and [Figure 3]e and surrounding the trapped cells and platelets [Figure 3]f.
Regarding the presence and distribution of cells within the membrane, [Figure 4] demonstrates that nucleated cells are observable at similar densities both at the center of the membrane [Figure 4]b and in its left and right borders [Figure 4]a and [Figure 4]c, respectively]. The counting of nuclei in three independent fields for each membrane portion indicates no statistical difference on cellularity along the membrane [Figure 4]d, P < 0.05]. 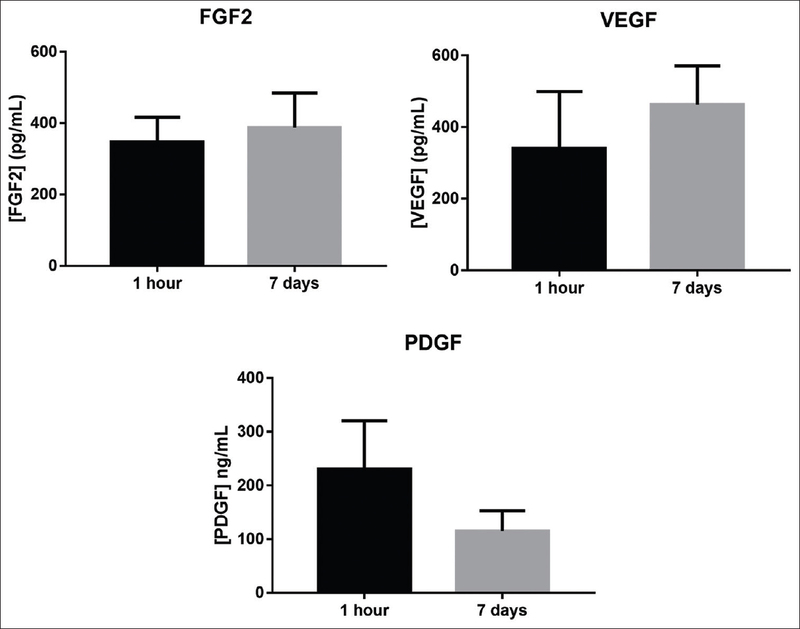 [Figure 5] shows that, during an elution assay, the membranes were able to release GFs such as PDGF, VEGF, and FGF2 in considerable concentrations within the 1st h. Curiously, similar levels of noncumulative release of VEGF and FGF2 were observed after 7 days of culture, without significant difference from 1 h (P > 0.05), indicating a continuous release with time for at least 1 week. PDGF presented a strong release at 1 h and a reduction on the mean GF concentration after 7 days of incubation, without statistical significance (P > 0.05). One of the main issues pertaining to the use of fibrin membranes today is their clinical efficacy for guided bone regeneration. Nonetheless, until the present, there are no consistent studies that demonstrate the efficacy of membrane-derived blood-GFs as a barrier against the invasion of soft tissue in the bone repair process. One intended characteristic of the final membrane is controlled resorption, which is highly dependent on the fibrin mesh stability, enabling the barrier to continue during a relevant clinical timespan. Modifications of the protocol for production of PRF,, as well as its associated other biomaterials, may represent a source of novel strategies to improve its clinical efficacy. Such is the case of CGF, an alternative protocol for the production of autologous fibrin derivatives, which modifies the original Choukroun's PRF centrifugation parameters through a patented concentration system (Medifuge ®, Silfradent, Italy). This process results in a biomaterial that contains CD34+ cells, releases GFs, presents a fibrin matrix with potential use as a scaffold, provided interesting results in diverse clinical settings,,, mostly employed as the injectable LPCGF. The same company patented a commercial device to produce APAG (Silfradent, Italy), through the heat-induced aggregation of human serum albumin originated from PPP. According to the manufacturer, the denaturized proteins aggregate mostly through hydrophobic interactions and disulfide bonds, resulting in a biocompatible polymeric material that is proposed as an injectable filler material for esthetic interventions (https://www.silfradentasia.com/apag.html). While albumin is nonadhesive to leukocytes and platelets, since it lacks integrin-binding motif such as fibrin Arginyl-glycil-aspartic acid (RGD), studies suggest that platelets may adhere to unfolded albumin through receptor-mediated mechanisms. Moreover, it is proposed that APAG may be mixed with LPCGF in a syringe, to produce an injectable esthetic filler containing CD34+ cells and GFs. Nevertheless, the scientific literature still lacks on reports that describe the structural properties of this biomaterial, as well as its capability of releasing GFs and providing desired clinical outcomes. 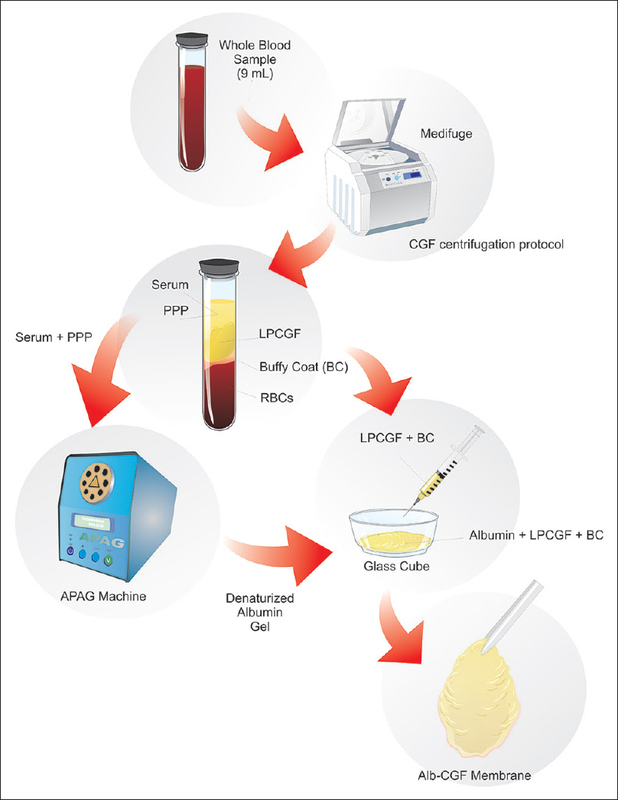 In the present work, a protocol is proposed employing the production of a denaturized albumin gel with the use of the APAG system and its association to LPCGF, however, with an important modification in its final step, i.e., the mixing of CGF and albumin. Differing from the manufacturer's proposed protocol, the syringe was substituted by a glass vessel aiming to (i) ensure the integrity of viable cells from the buffy coat, which could possibly suffer from the pressure imposed by the syringe pumping, and (ii) induce fibrin polymerization through activation by contact with the glass surface, resulting in a denser fibrin network. The resulting biomaterial is a moldable and yet resistant membrane, therefore presenting potential characteristics for adequate use as a barrier on tissue regeneration. However, as stated earlier, there was no scientific evidence in the literature assessing the ability of APAG + CGF to still produce/release GFs. In this sense, the present report demonstrates that the Alb-CGF, produced as proposed, is capable of both immediate and prolonged release (after 1 week) of important GFs related to tissue regeneration such as PDGF, VEGF, and FGF2, all described among the main factors responsible for the desired clinical outcomes of PRF therapy., Curiously, the levels of released cytokines are in the same order of magnitude as those found for PRF in previous reports employing equivalent and comparable elution methodologies. While several questions remain to be answered by further studies, the present protocol proposed for the production of an Alb-CGF membrane may represent an important step toward the development of autologous moldable and stable biomaterials for use as soft tissue barriers and potential for different applications in the oral cavity, as in periodontal regenerations, for example. Consequently, this proposal opens the way for further scientific efforts for in vitro, in vivo, and clinical assessments that could confirm adequate desirable clinical outcomes for the association of denaturized albumin and autologous CGF. We acknowledge the multiuser platform Labnano (CBPF, Brazil) for the use of the electron microscope. Soydan SS, Uckan S. Management of bisphosphonate-related osteonecrosis of the jaw with a platelet-rich fibrin membrane: Technical report. J Oral Maxillofac Surg 2014;72:322-6. Lourenço ES, Mourão CFAB, Leite PEC, Granjeiro JM, Calasans-Maia MD, Alves GG, et al. The in vitro release of cytokines and growth factors from fibrin membranes produced through horizontal centrifugation. J Biomed Mater Res A 2018;106:1373-80. Dohan Ehrenfest DM, Andia I, Zumstein MA, Zhang CQ, Pinto NR, Bielecki T, et al. Classification of platelet concentrates (Platelet-rich plasma-PRP, platelet-rich fibrin-PRF) for topical and infiltrative use in orthopedic and sports medicine: Current consensus, clinical implications and perspectives. Muscles Ligaments Tendons J 2014;4:3-9. Horváthy DB, Simon M, Schwarz CM, Masteling M, Vácz G, Hornyák I, et al. Serum albumin as a local therapeutic agent in cell therapy and tissue engineering. Biofactors 2017;43:315-30.
van Gelder JM, Nair CH, Dhall DP. Colloid determination of fibrin network permeability. Blood Coagul Fibrinolysis 1996;7:747-60. Mourão CF, Valiense H, Melo ER, Mourão NB, Maia MD. Obtention of injectable platelets rich-fibrin (i-PRF) and its polymerization with bone graft: Technical note. Rev Col Bras Cir 2015;42:421-3.
de Almeida Barros Mourão CF, Lourenço ES, Nascimento JR, Machado RC, Rossi AM, Leite PEC, et al. Does the association of blood-derived growth factors to nanostructured carbonated hydroxyapatite contributes to the maxillary sinus floor elevation? A randomized clinical trial. Clin Oral Investig 2018. https://doi.org/10.1007/s00784-018-2445-7. Borsani E, Bonazza V, Buffoli B, Cocchi MA, Castrezzati S, Scarì G, et al. Biological characterization and in vitro effects of human concentrated growth factor preparation: An innovative approach to tissue regeneration. Biol Med (Aligarh) 2015;7:5. Doi: 10.4172/0974-8369.1000256. Mackie AR, Losordo DW. CD34-positive stem cells: In the treatment of heart and vascular disease in human beings. Tex Heart Inst J 2011;38:474-85. Sivaraman B, Latour RA. Time-dependent conformational changes in adsorbed albumin and its effect on platelet adhesion. Langmuir 2012;28:2745-52. Matthews-Brzozowska T, Krzyżanowska A, Lichaj M. Revitalization of facial skin based on preparations of patient own blood. J Med Sci 2016;86:173-6. Nishimoto S, Fujita K, Sotsuka Y, Kinoshita M, Fujiwara T, Kawai K, et al. Growth factor measurement and histological analysis in platelet rich fibrin: A pilot study. J Maxillofac Oral Surg 2015;14:907-13. Bansal M, Kumar A, Puri K, Khatri M, Gupta G, Vij H, et al. Clinical and histologic evaluation of platelet-rich fibrin accelerated epithelization of gingival wound. J Cutan Aesthet Surg 2016;9:196-200.